A sixth suspect has been arrested over the machete murders of three men and attack upon a New Zealand and Australian trekkers in Papua New Guinea, police say. Officers with the aid of local villagers in Morobe province arrested the man on Sunday. Five men were arrested in connection with the attack last week. Provincial Police Commander Superintendent Leo Lamei said detectives were interrogating the suspects. He said another three, including two brothers are still hiding in between the Salamaua coastlines and Wau jungles. "We are tracking the three remaining suspects through the villages in and around Wau such as Bito, Skin Diwai, Biawen and Banis Donkey," he said in a statement on Sunday. "Two suspects have surrounded to village leaders at Mubo and Salamaua respectively and have been air-lifted to Lae and are being interrogated," Supt Lamei said. A total of six suspects are now in police custody. Two of the three suspects are brothers who escaped from the Wau police cells in 2011. "I thank the leaders and people for helping police capture the suspects. I appeal to them to continue assisting police capture the other remaining suspects," Supt Lamei said. Papua New Guinea will take over full ownership of the Ok Tedi mine, after the government of Peter O'Neill pushed through laws in parliament. The laws passed on Wednesday also quash a 12-year-old law giving BHP Billiton immunity from prosecution for environmental damage stemming from the gold and copper mine's construction in the 1990s. The laws cancel the PNG Sustainable Development Fund's (PNGSDP) shares in the mine, and issue new ones granting the state 100 per cent ownership of the mine in PNG's Western province. The PNGSDP was set up by BHP Billiton to manage the proceeds of the mine on behalf of the people of Western province when the mining giant withdrew from PNG. "Mr Speaker, it is the state's view that it is in the best interests of the people of Western province and PNG that the state have 100 per cent of the shareholdings in (Ok Tedi)," Mr O'Neill told parliament on Wednesday. "The state commenced discussions with BHP Billiton with a view to acquiring PNGSDP's shares in OTML and changing PNGSDP's program rules. "However, BHP Billiton has withdrawn from all discussions and the negotiation has broken down." The laws passed on a vote of 62 to none. Tensions between the government and the PNGSDP had been mounting for months. On Tuesday, former prime minister and PNGSDP chairman Mekere Morauta launched a pre-emptive salvo at Mr O'Neill, saying his attempts to take over the mine amounted to theft. "Stealing an asset worth approximately ($A860 million) to the people of Western, plus their annual share ($A193 million) of the Ok Tedi Mine dividends, is not acceptable legally or morally. "It is unconstitutional as well. "I also fear this is the first step - I hope he does not want to get his hands on PNGSDP itself and the $US1.4 billion ($A1.50 billion) in the long-term fund," Sir Mekere said. In his speech to parliament, Mr O'Neill said shareholders will be compensated. "Mr Speaker, the state is not taking these shares," he said. "The state will be providing some compensation to PNGSDP. The proposed bill will provide that the prime minister, on the advice of (cabinet), will determine an amount of compensation; and to whom any compensation shall be paid." In his speech removing BHP Billiton's immunity from prosecution for environmental damage sustained in the `90s, Mr O'Neill raised the recent BP oil disaster on the Gulf of Mexico. "BP accepted responsibility for the disaster which has destroyed the environment and marine ecosystem and affected human lives in the US," he said. "Why not BHP? What is so special for them to be granted total immunity for what they have done?" He also took a swipe at Sir Mekere for passing laws in 2001 granting the mining giant immunity. "Mr Speaker, no one can sit in this house and excuse BHP for the destruction it had caused," Mr O'Neill said. "But that is what the government under Sir Mekere Morauta did in 2001. "They came up with a deal that would grant total immunity to BHP from prosecution for environmental damage or compensation, in exchange for a program company set up outside of PNG, and still controlled by BHP." BHP has repeatedly denied it controls the PNGSDP. Comment is being sought. 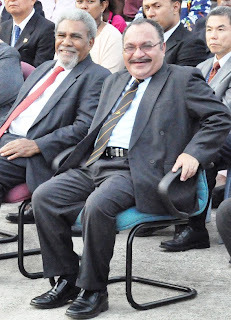 Prime Minister Peter O’Neill yesterday hit back at PNG Sustainable Development Program (PNGSDP) chairman, Sir Mekere Morauta, disparaging him as a stooge for BHP Billiton. Responding to yesterday’s The National front page story, in which Sir Mekere accused the government of trying to “steal” the assets of the people of Western province through Ok Tedi Mining Ltd (OTML) and PNGSDP, O’Neill said it was the former Prime Minister who was doing the stealing and lying. “The central claim that we are trying to expropriate Ok Tedi Mining is simply false and very, very misleading,” O’Neill told reporters at his parliament office. “This is coming from a person who held the position of prime minister, and it is of concern that a person of his nature can make deliberately misleading statements, to justify his own interests and his own issues. “One of these is that we are trying to virtually ‘steal’ the assets of OTML and PNGSDP. “The people of PNG already own these assets, so how can you steal from yourself? “People of Western province and PNG own the resources, own the mine, own the shares that were gifted by BHP, so how can you accuse people of stealing their own property? “Sir Mekere is very much incapable of divorcing his vested interests, and personal interests in this matter. “His claim we consider to be self-serving, and again as I said, a very deliberate attempt to mislead our people as he did in 2002 when he was prime minister. “He misled our people, he gave immunity to BHP from prosecution for the huge environmental damage that was done as a result of the operations of the mine to the Fly River system in Western province. “Of course, we all know that he has been rewarded with a very plum job of being chairman of the PNGSDP, which in turns makes him acquire another job as chairman of OTML. “He does not represent the people of PNG, he does not represent the people of Western province…in any shape whatsoever. “His interests are very clear. “He represents foreign interests, he represents BHP. “I ask who is lying to the people of Western province, who is lying to the people of PNG, whose interests is he protecting? “These are the questions he needs to answer. O’Neill said it was time for the PNG government and the people of Western to take over the operations of the mine as PNGSDP had failed to do its job. “This is why we are now saying that after 10 years of continued mismanagement, continued disinvestments, that PNG government and the Western provincial government play a direct role in management,” he said. “We know for a fact that there are mixed successes, but there are a lot of failures. PNG Sustainable Development Program today supported recent statements by Community Mine Continuation Agreement leaders rejecting the Government's proposed expropriation of Ok Tedi Mining Limited. PNGSDP CEO David Sode said the CMCA leaders were right and were entitled to their expressed views: the Government takeover of a mine owned 100 percent by the people of Papua New Guinea, without paying them compensation, is unacceptable, not only in PNG but anywhere in the world. "Any such takeover strips away the right of the CMCA people to have the final say in whether the mine continues or not, and threatens their involvement in decisions on the appropriate level of compensation for environmental damage," he said. "It also puts at risk the receipt and management of their rightful share of dividends from the mine, and the social and economic development that is provided from those dividends. It also takes away their rightful share of dividend flows from the mine." Mr Sode said it was important that full consultations should take place as they had for every other major decision on the mine, including the Ok Tedi Mine Continuation Ninth Supplemental Agreement Act 2001, the 2006-2007 Review of the CMCA and just last year the Mine Life Extension proposal now before the Government. It is apparent that The CMCA had not been fully consulted in this case until the leaders took matters into their own hands and insisted that the Prime Minister meet them in Tabubil in August. The Prime Minister has not responded to the concerns expressed by the CMCA leaders at the Tabubil meeting. "The Prime Minister has a moral as well as legal obligation to consult the people who own the resource and are the only people in the country affected by any environmental impact from the operation of the mine," Mr Sode said. "Why has the Western Province in general and the CMCA communities in particular not been consulted? "The Government's proposals change everything, yet there has not been one bit of consultation. There needs to be full consultation with all Western Province people before any decision can be made." He said PNGSDP, as custodian of the Western Province people's shares in OTML, shares CMCA concerns for the future well-being of the mine-impacted communities, including mine area landowners." PNGSDP supports the continuation of the PNGSDP-CMCA arrangements. PNGSDP has a clear legal and moral duty to protect the interests of the CMCA communities and Western Province and to protect the value of the assets that it holds on their behalf, Mr Sode said. He pointed out the dangerous precedent being set by the Prime Minister and members of Parliament who vote in favor of such expropriation bills in attempting to exercise improper use of the legislative powers to steal the Western Province’s inheritance. "Is he going to get away with this and is it going to be repeated elsewhere? "Resource owners throughout PNG should be aware of the precedent being set and stand up for their rights and support the CMCA leaders." 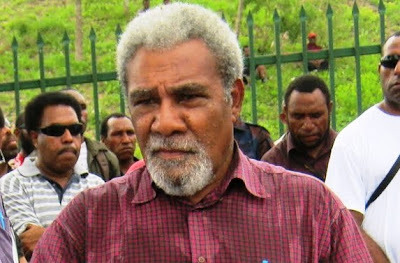 The chairman of PNG Sustainable Development Program Limited, Sir Mekere Morauta, said the decision by the Prime Minister to expropriate Ok Tedi Mining Limited without compensation was "nothing more than stealing an asset belonging the people of Western Province. "Those shares are owned by the people of Western Province, not PNGSDP. PNGSDP is merely the custodians of them. "The Prime Minister is legally and morally obliged to pay a full and fair price if he is so determined to get his hands on them." Sir Mekere said PNGSDP would do everything in its power to prevent expropriation without compensation, and was ready to take legal action if Mr O'Neill brought this dangerous legislation to Parliament. The company would stand with the people of Western Province, especially the communities affected by mine operations and landowners, who have voiced their strong opposition to the Government's plans. "PNGSDP has a duty to protect Western Province people's assets, and will do so with all necessary legal means," Sir Mekere said. "Stealing an asset worth approximately K2 billion to the people of Western Province, plus their annual K450 million share of the Ok Tedi dividends, is not acceptable legally or morally. It is unconstitutional as well. "I also fear that this is just the first step - I hope he dos not want to get his hands on PNGSDP itself and the $US1.4 billion in the Long Term Fund." Sir Mekere said he was shocked by the Prime Minister's announcement of the expropriation on EMTV last night. He had spent the past six months trying to negotiate with the PM for a fair deal on the Western Province's 63.4 percent shareholding held by PNGSDP. He was aware that many MPs were concerned by Mr O'Neill's decision, which had been taken in isolation and against the recommendations of some of his most senior and respected advisors. Sir Mekere said Mr O'Neill's criticism of PNGSDP's record on sustainable social and economic development were nonsense - PNGSDP's had spent approximately K1.18 billion on more than 600 sustainable social and economic development projects since it began operations in 2002. "Compare PNGSDP's commitment to development of Western Province with the achievements of the national Government," he said. "The national government has done very little for Western Province with the $US3.8 billion it has received in taxes and dividends from Ok Tedi. "Where has that money gone? It has been wasted, mismanaged and misappropriated and PNGSDP has been left to do things that are rightfully the responsibility of the Government. Just imagine what will happen if the Government gets its hands on the PNGSDP dividends and the $US1.4 billion in the Long Term Fund. "That money is to be used for development for 40 years after the mine closes." Sir Mekere said PNGSDP had been an efficient, responsible, transparent and accountable custodian of Western Province's assets, and compared its performance with the Government's record in business and financial management. All the value in the Tolukuma mine was destroyed when it was put into a State-Owned Enterprise and came under political influence. Other SOEs were struggling under the same burden - power supplies and water and sewerage systems across the country are totally inadequate. The delivery of essential services was bad and getting worse. "The risks of turning OTML into an SOE far outweigh the benefits. It would destroy the mine and threaten the future flow of dividends and consequently the future development of Western Province. o Mr Sam Koim, head of Operation Sweep, estimates that almost half of the annual development budget between 2009 and 2011 was stolen –this amounts to approximately K3.5 billion. o The O'Neill Government's own Minister for Works and Implementation, Mr Francis Awesa, estimates that K9 billion seems to have disappeared from government-held trust accounts between 2007 and 2011." Sir Mekere also said expropriating a privately-owned asset with no compensation sends a very bad message to the world. "The international perception will be that no company's asset or investment is safe, that PNG is not a good place to invest." Morobe police commander Leo Lamei says the four remaining suspects in last Tuesday’s Black Cat Trail murders and attacks are basically “dead men walking” if they do not turn themselves in like their four colleagues did on Sunday. He told The National yesterday there were now up to 74 police officers and villagers scouring the rugged terrain between Wau and Salamaua for the remaining four suspects, after four were arrested on Sunday, and there was little if no chance of them escaping or getting out alive if they did not turn themselves in. Police – with their ‘Eye InThe Sky’ helicopter - have been searching the rugged terrain between Wau and Salamaua for the gang that killed two local porters and attacked eight expatriate trekkers along the Black Cat Trail last Tuesday. A man suspected of harbouring the suspects was hacked to death by angry relatives of murdered porter, Mathew Gibob, of Skin Diwai village. “I ask them to surrender to police, village leaders, or pastors,” Lamei said. “If they do not surrender, the relatives of the dead and injured porters will attack them. Lamei commended villagers from all along the Black Cat Trail from Wau to Salamaua for their support. “I want to commend the villagers, the people of Salamaua, the people of Wau, and especially the villagers of Bitoi and Mubo,” he said. “Without them, we would not have arrested the first four suspects. Lame said the hard work put in by police over the last week deserved the highest praise. “I would like to praise my men for a job well done, especially in arresting the first four suspects in just a few days, when it could have taken weeks or months in such rugged terrain,” he said.